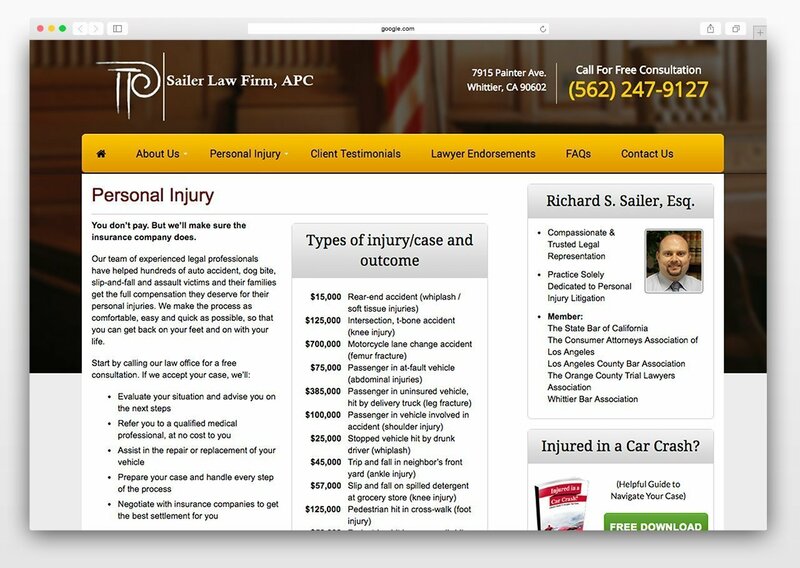 Rich Sailer and Sailer Law Firm are based in Whittier, California, but serve clients all over Southern California. 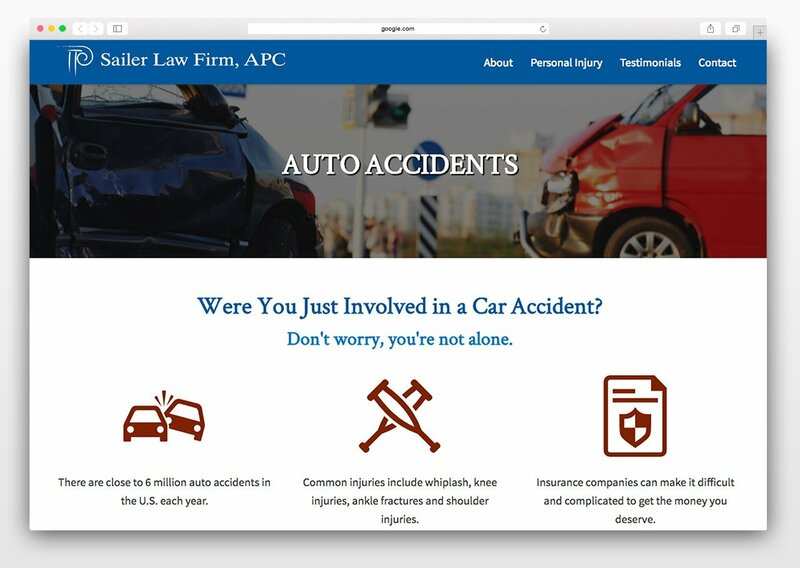 They have strong team that specializes in personal injury cases. Many of their clients praise Rich Sailer and his team for their honesty and approachability. 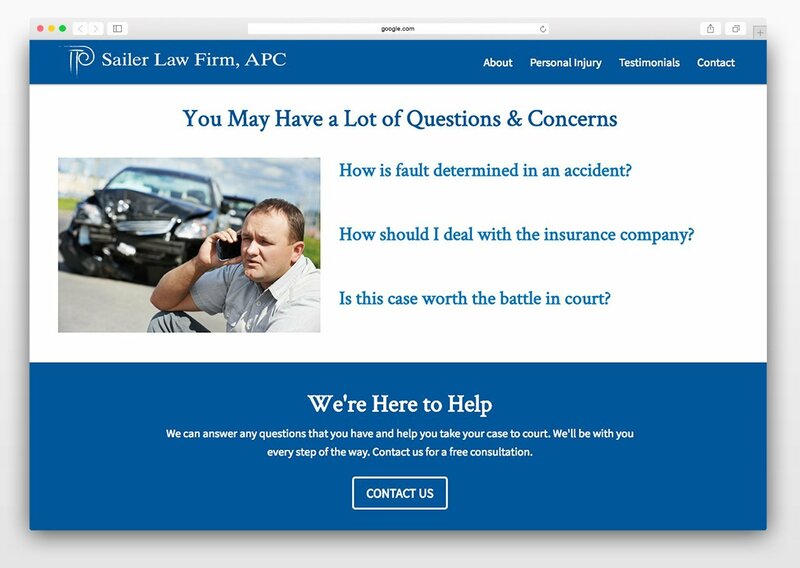 The Sailer Law Firm website was last redesigned in 2014, but the design looked like it came from over a decade earlier. Rich had invested in creating a lot of great content, but it wasn’t displayed in the best way. The style looked outdated and the pages seemed too busy with text. The site was also not mobile friendly, so it was difficult to view on a phone. Sailer Law Firm wanted a professional yet approachable feel. We did this by using blue as the primary color – which brings out feelings of trust, stability, and justice. We made it approachable by using a lot of photos of people with emotions along with personal “you” language, so that visitors could feel more relatable. Sailer Law Firm had a ton of great articles on legal issues that they had written, and we wanted to preserve that. We simply reorganized them so that they were easier to navigate. And of course, the new website looks good too. It’s clean, modern, professional, and mobile responsive. 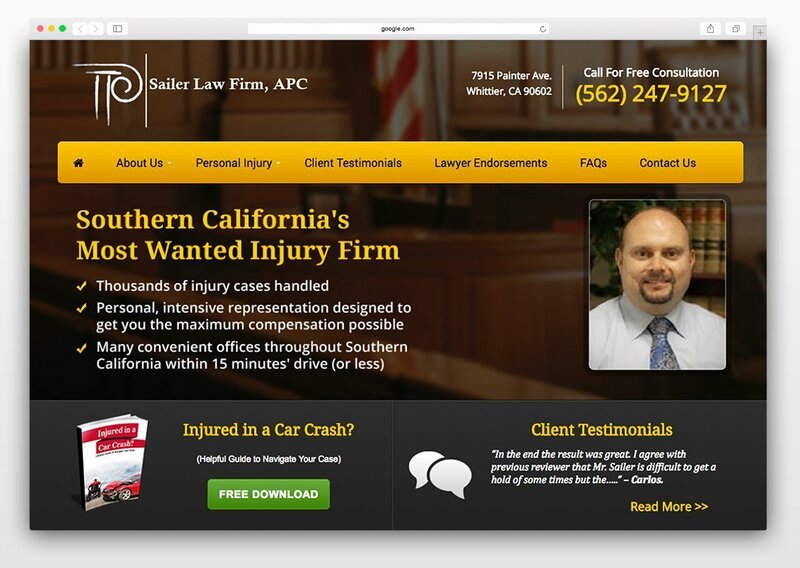 Rich knew he needed a new website to grow his law firm. After partnering with SparkFlow, we created a website that finally matched that professionalism for his business. After launching the new modern website, we saw the website traffic steadily increased and pages per session also increase, meaning people were staying on the site longer to browse around. 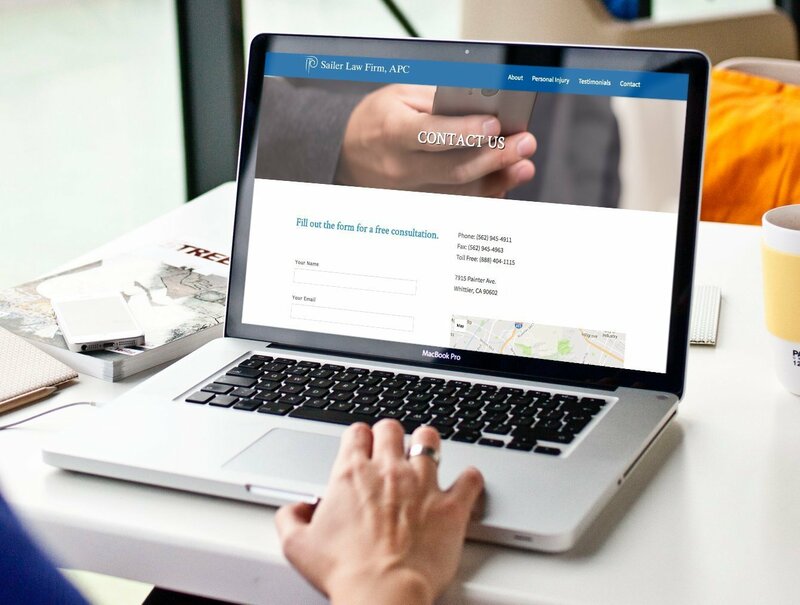 As a result, Sailer Law Firm also got a bump in potential clients filling out contact forms. You may be in a similar position as Rich. You have great business that you want grow, but it’s being stunted by your current website. It has an outdated design, and you’re a little embarrassed to share it. It’s busy and hard to navigate, so people aren’t becoming leads and customers. It’s not mobile responsive, so you’re losing all your mobile visitors. 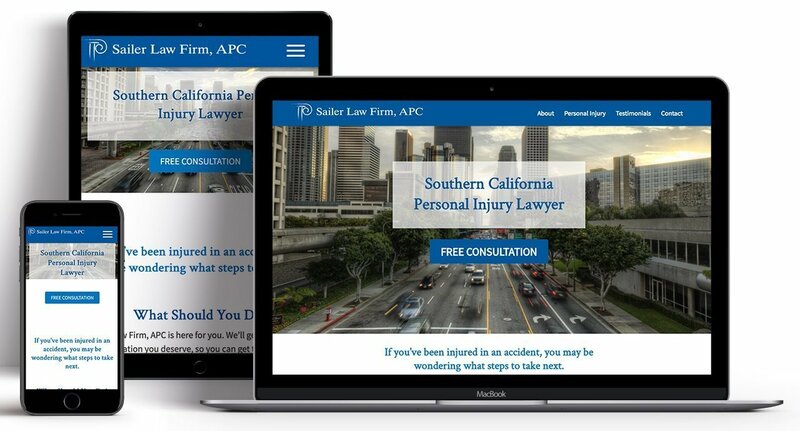 Like Rich & Sailer Law Firm, you can get a brand new website that is modern & aligns with the professionalism of your business. Learn more about our web design services and get started today with a free consultation.